So writes tenor Giuseppe Maletto in the booklet notes. Bring it on, I hear you cry this is nothing if not auspicious from the ensemble that has recently given us such a successful Book 6 of Gesualdo's madrigals (reviewed by Andrew O'Connor in April 2014), and all the more welcome since it has been a while since a really successful version of the Responsories came our way. The set stretches to three CDs. Those who know these pieces from the inside might conjecture that some researcher might have discovered that the motets should be performed with even more repeats, which happily is not the case. Neither is it the case that the performances are particularly slow (although they are certainly not breezy, regularly a minute or even two per motet slower than the Hilliard Ensemble's timings) ‑ instead, the performers have taken the madrigalian nature of Gesualdo's writing as their cue to include some madrigals proper, connected to the Passion subject, both from Gesualdo and from his contemporaries. La Compagnia del Madrigale performs these works at a semitone above 'modern' pitch. The sopranos are ringingly bright, alto Flena Carzaniga manages to make her presence felt on the low‑lying alto line (is that a hint of relief when the line finally breaks out into a high C at 'inter mortuos liber' in the 26th of the 27 motets? ), the tenors are clean and true, Daniele Carnovich's bass timbre is as rich as ever (although one might quarrel with him transposing quite so many cadential notes down the octave) and in general the full ensemble's blend is delectable. It is rare to hear voices of quite this kind of singerly quality join forces in such an ensemble. This makes for some wonderful ensemble moments even if it does pose problems for balance at those moments where Gesualdo takes some of the voices away from their 'sweet spots'. There is something more troubling here, though: what the Compagnia delivers, as lovely as it consistently is (and it is certainly already recommendable for that alone), is not really what it promises. For the most part the lines are beautifully sustained, with no exaggerated leaning into dissonances or harmonic ruptures and only the minimum 'Madrigalian' teasing out of the verbal rhythm. This is undeniably a valid standpoint and certainly an asset in its own way but it takes a little while to attune the listening ear to the benefits of this approach when one bas been so eloquently tempted with just the opposite. Regardless, this is extremely seductive singing, right from the first full textures of In monte Oliveti. The drooping lines which open Tristis est anima mea are no less wonderful for the relatively inward interpretation they receive here and perhaps the scurryings of 'vos fugam’ are even more striking as a result. Still, the key to that motet is the tortured harmonies of 'et ego vadam immolari pro vobis' ‑ and here La Compagnia is perhaps a little too content to slacken off the tempo (rather spectacularly!) and wallow in the textures rather than properly turning the major‑to­-minor screws of the harmony. There are some strange rhetorical choices: the emphatic repetition of 'attendite et videte' near the beginning of O vos omnes seems an odd moment to bring in an echo effect. One problematic textual point deserves a mention. At the text 'Ut quid me dereliquisti' in Tenebraefactus est, the old complete edition gives an improbable‑ sounding cadence onto a G minor chord ‑ a dramatic masterstroke at this of all places in the text (why hast Thou forsaken me?') if Gesualdo really intended it. The Hilliards take the minor chord; many groups prefer a G major chord; the new recording seems to hedge its bets, taking a major chord but with the third barely hinted at. The third book in general seems to bring out finer things. 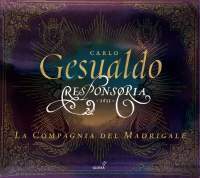 Perhaps Gesualdo's writing has something to do with it (he certainly did save some of his most audacious strokes, both in harmony and in scoring, for some of the last motets). Perhaps the singers themselves found a more dramatic palette as the project progressed. 'Destruxit quidem claustra inferni' from Recessit pastor noster is a truly bizarre piece of writing even for Gesualdo (some of the lines would hardly be out of place in Webern) and fortunately La Compagnia brings it the right kind of strangeness. 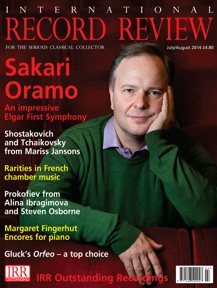 record ‑ I frequently dipped into their recording to compare a small detail and had to tear myself away three complete motets later. While the Compagnia's sopranos stay well within their comfortable register, the Hilliard countertenors are audibly near their limit when the lines soar, and bass David Beavan, singing no less than a minor third lower than Carnovich, is frequently at the other extreme with magnificently sonorous and occasionally eloquently gravelly results. La Compagnia's version is meticulously crafted and from beginning to end exquisitely sung ‑ it seems petty to criticize it for that very reason, but if there was ever music begging for something more than that, this is surely it.